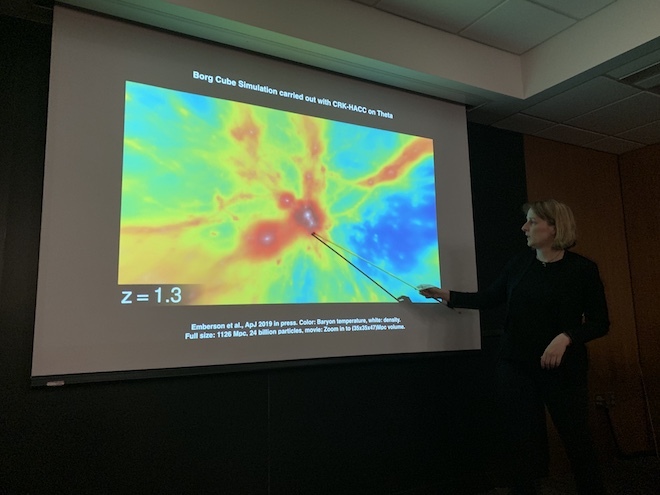 Last Tuesday evening, dozens of people squeezed into a small conference room in the Technological Institute to see Dr. Katrin Heitmann, an Argonne National Laboratory astrophysicist specializing in cosmology. The crowd – some sitting on the floor, others leaning against the wall – had gathered for her talk on dark matter and the systems used to better understand it. From a young age, Dr. Heitmann had been interested in physics. She first studied particle physics before switching to cosmology, a rapidly expanding field in the 1990’s. Cosmologists research the origins and the evolution of the universe with a focus on huge phenomena measured on the scale of lightyears and millenia. Dark energy and dark matter – the subjects of Heitmann’s talk – intrigue and often frustrate cosmologists. Little is known about dark energy, except that it is related to the universe expanding. According to Dr. Adam Reiss, winner of the Nobel Prize in physics, dark energy is like a loaf of raisin bread in the oven. As the bread bakes, it expands and the raisins grow farther and farther apart. Now, imagine galaxies in place of the raisins, and dark energy in place of the bread dough. Dark matter is there, too. Decades ago, scientists realized their models of the universe didn’t quite fit. That’s because of invisible dark matter, which occupies space and has mass but can’t be detected at all on the electromagnetic spectrum. Added up, dark energy and matter consist of an estimated 95 percent of the universe. To make sense of dark energy, there are so many different components – mapping the sky in gamma rays and X-rays, creating a graphic interpretation of the data and layering them one on top of the other. Research on dark matter heavily involves computer simulation and analysis. The images Dr. Heitmann displayed were reconstructed from computer models, a digital recreation of what we couldn’t see. In fact, Dr. Heitmann’s team developed their own software program to better understand dark matter. Hardware/Hybrid Accelerated Cosmology Code, or HACC, is designed to run on supercomputers. It can predict how dark matter clumps up and disperses throughout the universe. Heitmann says cosmology needs more computer scientists. Now, advances in technology have made it much easier for HACC to transfer to other computers. Back in 2008, Dr. Heitmann wrote HACC on what was then the fastest supercomputer. The machine ran at a speed of 1 petaflop, or 10^15 calculations a second. This past winter, Dr. Heitmann worked in a lab with a 200-petaflop computer. She’d installed HACC on this machine over the course of a single afternoon. Besides the updated software, Dr. Heitmann is grateful for the chance to work at Argonne. Ultimately, Heitmann says, her work is made possible by a deep collaboration between the fields of physics, computer science and statistics – and Northwestern students are welcome to help. Aspiring scientists and mathematicians alike can work at Argonne over the summer.